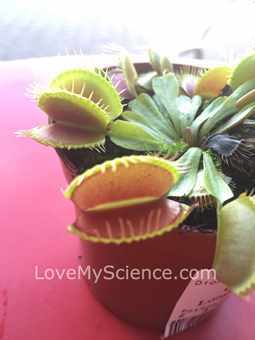 Venus Flytrap chemical and movement Reaction Experiment. This is a plant changing experiment. 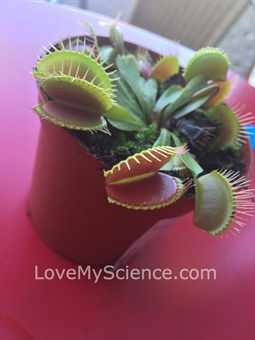 Is a Venus Flytrap plant actually a trap? 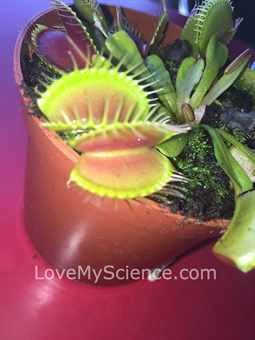 Have you ever seen a Venus Flytrap in action? Does it really eat its prey? How does it know that an insect has entered its trap? Did you know that this plant is a predator that waits patiently for its prey to walk, crawl or fly into its trap? Being unaware of this trap, insects and spiders walk or fly into their fatal end. Once an insect steps or flies into the mouth of this plant the jaw swiftly shut and close around the insects body and there is no escape. The Venus Flytrap is a carnivorous plant. Inside the mouth (or leaves) of the fly trap are trigger hairs. These hairs are short and stiff and are called triggers or sensitve hairs. When the prey (flies, spiders and small insects) lands or crawls into the middle of the leaves and bend the sensory (trigger) hairs the jaws closes in less than a second and the insect then becomes a meal for the plant. The insect is then digested. The leaves inside secrete a sweet nectar to attract insects to come in and then be captured. Have a look at our pictures and video of a the plant in action (not with an insect). We used an object to trigger the leaves to close. If you place or touch an object just inside the leaves they will fold closed but leave a bit of a gap. If there is no movement or struggle from the object to get out the leaves will not close completely. However, if it detects the wriggling of a trapped insect this will cause the jaw to close completely. Next time you are shopping in the plant section of a store look to see if there are any there for sale.